The Monster Hunter brand is big in Japan. Big enough to support an adorable, gameplay changing spin-off in the form of MonHun Nikki: Poka Poka Ailu Mura. It's Japan's biggest game right now. The PlayStation Portable game moved more than a quarter million copies in its debut week in Japan, according to sales tracker Media Create. 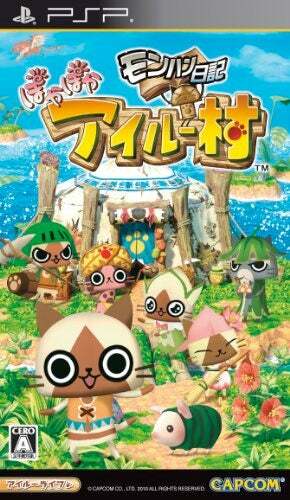 MonHun Nikki: Poka Poka Ailu Mura is something like a blend of regular Monster Hunter and Animal Crossing. It also has hooks into Monster Hunter 2nd and Monster Hunter 3, which might help explain its big numbers. Another PSP game joins MonHun Nikki at the top of the list, Namco's Ace Combat: Joint Assault with adventure game Hakuoki: Zuisouroku Portable rounding out the new top ten additions to the chart. For the bestselling games in Japan for the week of August 23 to 29, here you go.